Boy band Take That and pop star Britney Spears will go head-to-head in the UK when they release their new albums of the same title, on the same day. In September Spears announced her sixth studio album, Circus, would go on sale in the UK on 1 December. But now Take That have said The Circus - the follow-up to their comeback album Beautiful World released last year - will also be in shops on the same day. 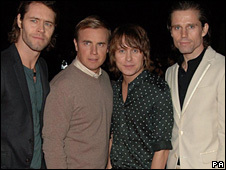 Take That will release the first single off the album on 24 November. Greatest Day was written by all four members - Mark Owen, Jason Orange, Howard Donald and Gary Barlow. Their last album sold more than 2.5 million copies in the UK, making it their most successful record to date. The group reformed in 2005 after 10 years apart. Since then they have won a string of awards, including an Ivor Novello for single Shine and three Brit Awards. Spears, who has been filming the video for her next single Womanizer, has also enjoyed a well-received comeback in recent months. After suffering a very public breakdown last year, she won three prizes at last month's MTV Video Music Awards. In the video for Womanizer she plays several different characters, including a secretary and a tattooed waitress.